Well, one thing about publishing and book covers. Take a look at a series you have. You'll notice that the publisher creates all the book covers for that series in a similar style. It lets you know the books go together. Of course, we wanted to do that here. In the above cover, there's this burlap "frame" that lets you peek through and see a double sunset (yes, double--in the world Caprice has created there are twins suns). She had originally self-published this book, along with the second book, and she already had a double sunset image on the first version. The self-publishing company she chose decided to be complete jerks about her keeping that image after she left them, so Grace created a new, and way better image. But it was still the same idea as the original. 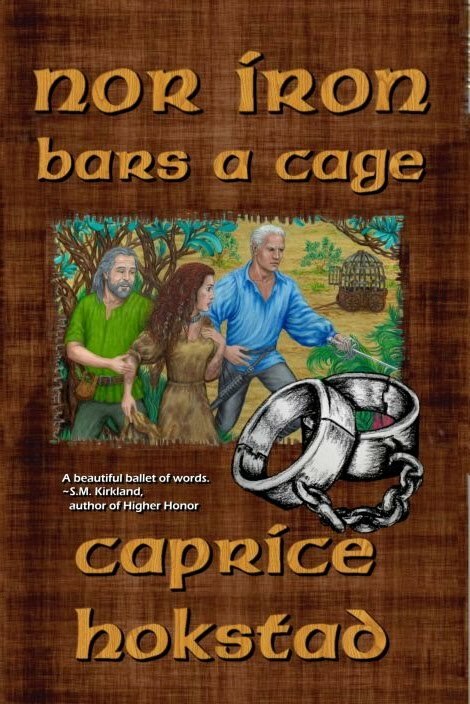 For Caprice's second book, Nor Iron Bars a Cage, she also had artwork, but this artwork was not gained through the self-publishing company. Caprice commissioned it from Audrey Rawlings Arena. 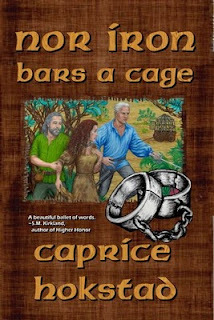 Grace placed that painting inside the burlap "frame" of Nor Iron Bars a Cage. But I found a set, tweaked the arrangement, and drew it. Black and white to match the key, of course. Scroll up for a moment, and check out the subtle differences. 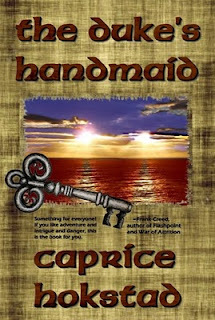 The Duke's Handmaid has lighter burlap and darker text. Nor Iron Bars a Cage has darker burlap--same shape and size, though--and lighter text of the same font. Clever, I think. My drawing is in the lower left corner on TDH, and the lower right corner on NIBaC. Clever again. Grace has laid these both out consistently, but with enough difference to mix it up a bit. And the covers look even cooler in person :). You know, of all the pictures and drawings of shackles I have ever seen, none really matched the image I had in my head as well as what you came up with, Kat. And other than the novel itself, we did NOT have any conversations about what they should look like. I know what kind of strange things you found on image search because I had done one before I commissioned the painting with Audrey, trying to find just the right example to show her. But what I wanted didn't exist except in my mind until you did this (three years later, I should point out). Thank you. 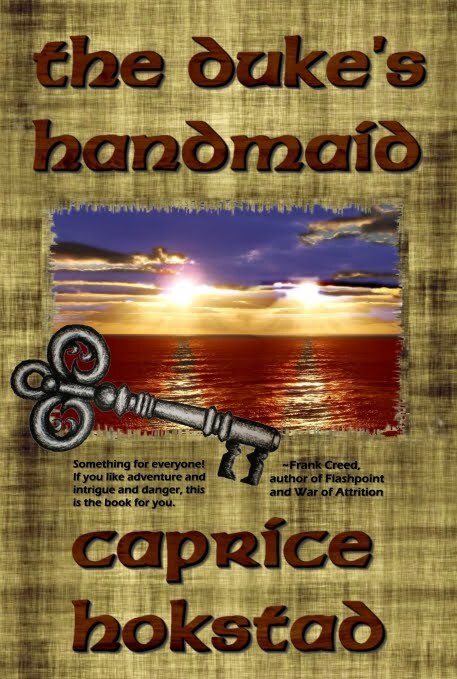 Thank you, Caprice! I'm smiling big right now :D.